My parents came out for a visit last week from Montana for a few days. We had no plans made other than blueberry picking so I browsed the internets in search of something for us to do. 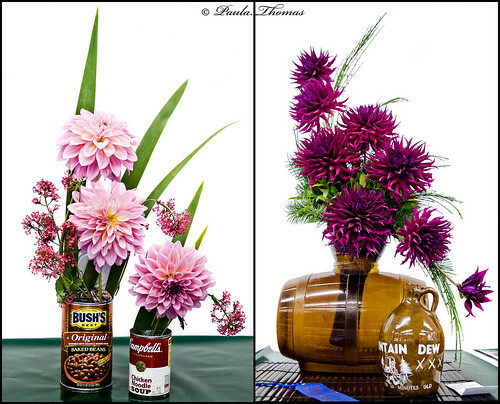 I came across the 100th Annual Dahlia Show in my search. My parents are avid gardeners, both vegetable and flowers. Though they don't have any dahlia's in their garden, I thought it would be something fun to do. We drove out to Forest Park in Everett to check it out. There were several buildings full of dahlia's and even tables outside that were stacked. A couple of buildings were filled with a single dahlia in a pot. One building was full of the history of dahlias. Not being a history fan, I didn't spend much time in that building, too much reading for me! There was another building with photos of dahlias. My favorite building though was the flower arrangements. There were a lot of fun and creative pieces. These were two of my favorites. I have more photos from the show on Flickr. 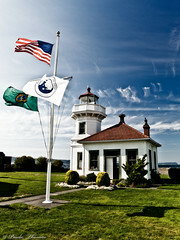 After the Dahlia festival we took a short drive to Mukilteo and visited the Lighthouse Park. I've never been there but have always wanted to go because I love to photograph lighthouses. While my parents stared out at the water and watched the ferries come in and out, me and Mark went up into the lighthouse. There was a nice view of the Puget Sound and the ferry docks. We couldn't spend too much time up there because only a couple people are allowed up at a time and there were more people waiting to go up so we took a few snapshots and headed back down. It was a nice warm day and the ice cream was calling us so we walked a few blocks to get some soft serve at Ivars. I actually got a root beer float which I haven't had in I don't know how long, but it hit the spot.